''These results are in line with what we guided the market on in September this year. What it doesn’t reflect is the hard work we’ve been putting in over the past six months. 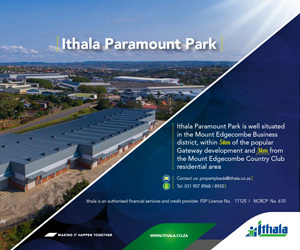 “Apart from the imminent completion of Fourways Mall, we’ve been focusing very hard on managing the property fundamentals within the portfolio. Letting activity is improving with several new tenants expected to drive vacancies down further. The 178 000 m2 Fourways Mall will consist of approximately 450 stores. As one of the fastest growing nodes in the country, retail in Fourways and its surrounding catchment area has proven buoyant despite the recessionary macro-economic environment. “The densification of the Fourways catchment area is one of the key positives for the Mall and the Fund however, to enhance the shopping experience and relieve existing congestion, approximately R400 million in infrastructure improvements have been invested around the precinct, including road widenings fly-overs and slipways to improve access and egress, as well as with general traffic flow throughout the node,” Georgiou said. “Fourways Mall is unique in its large format fashion and one of a kind entertainment offering. Future proofing the shopping experience and expanding our natural catchment area with these exceptional offerings have been a big consideration in our tenant mix,” he added. Accelerate will ultimately hold a 50% stake in the Fourways Super Regional Mall on completion of the project. The Mall boasts Africa’s first KidZania, the internationally renowned children’s educational city, empowering children through play with informative career choices and creating over 500 jobs during development and ongoing operations. Other entertainment attractions include the Fun Company and Bounce’s flagship store, both of which are already trading well and have launched the Funds shoppertainment strategy. Fashion brands represented include H&M (2 677m2) and Truworths (4 142 m2), whilst Woolworths (11 493m2) and Edgars (10 400 m2) will offer a full range of fashion labels, in line with international trends and other super regional malls. International do-it-yourself super store, Leroy Merlin will take up 17 000m2 to house their head office and flagship store. This super store is adjacent to Fourways Mall, to be linked by a pedestrian bridge across Fourways Boulevard housing retail home offerings. De-gearing projects totaling in excess of R1.7 billion are well underway. The proceeds of these sales will be used to pay down debt, buy back shares and for reinvestment into the core portfolio. Management successfully refinanced maturing debt and is currently 96% hedged against increasing interest rates. The Fund’s total all-in cost of debt is approximately 8.3% with an extremely defensive weighted average lease expiry of 5.4 years. “Despite tough economic conditions, we are excited by the future prospects of the Fund. Our reduced gearing will allow headroom for growth and various earnings-enhancing initiatives will further support distribution income. This will be bolstered by the opening of Fourways Mall in the new financial year,” concluded Georgiou.